Oh yes, goop! 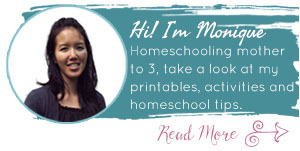 It must be one of my favorite simple messy sensory materials: Two of the simplest ingredients ever make a really fun material with properties you don’t see every day. It’s taste safe, easy to clean up, and just all around great 🙂 N first played with it when he was only 8 months old, and it was an absolute blast. 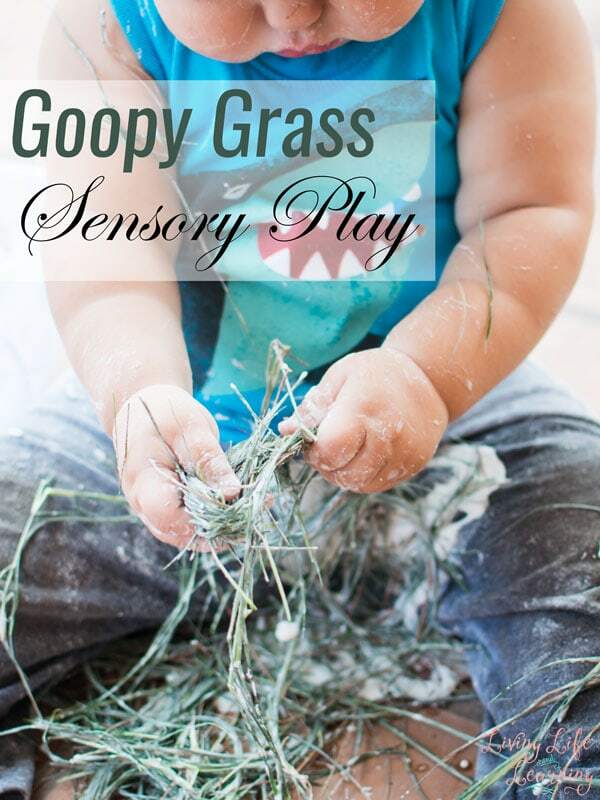 For today’s activity, I added another simple material, and N enjoyed some Goopy Grass Sensory Play! If you make straight-up goop, the best proportions of goop and water are usually about 2-3 to 1, adding water slowly to make sure the mixture doesn’t get too wet. For this “goopy grass”, I didn’t shoot for the perfect goop and simply added some cornstarch to a bin full of grass and added a bit of water. 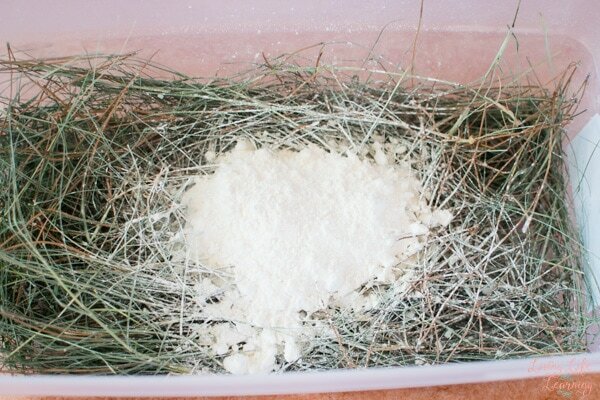 If you’d rather have excellent goop, make it first and add the grass when you’re satisfied with your base material. N didn’t care either way and dove right in. 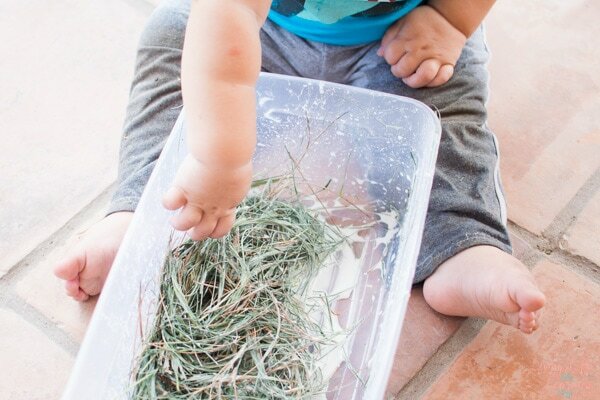 Most of the grass was already spread out on the floor when N decided to dump what was left in the sensory bin into his lap. That’s where the majority of the actual goop came into play. 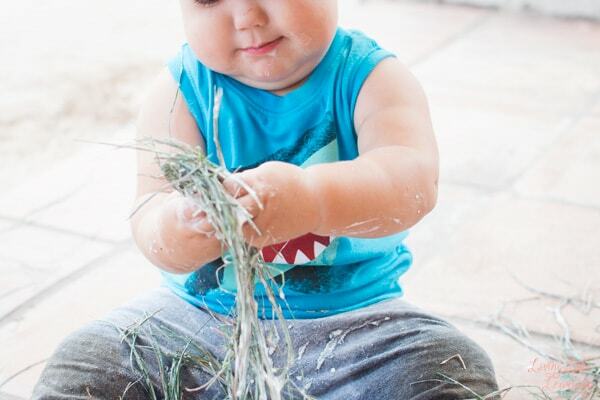 The mess in his lap didn’t faze him at all, and he kept playing with the grass for a good long while. At that point, there was quite a bit of goop on his arms and his face, but it wiped up very easily. The easiest way to get rid of goop on the ground is letting it dry and vacuuming or sweeping it up. Alternatively, use a hose and wash it away if you’re outside in an area where that makes sense. Don’t wash larger amounts of goop down the drain, though. Put it in the trash instead. 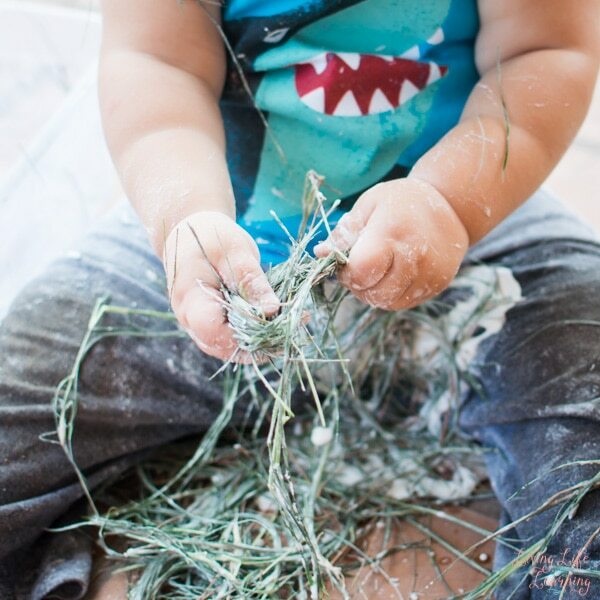 Are you ready for more messy toddler play? 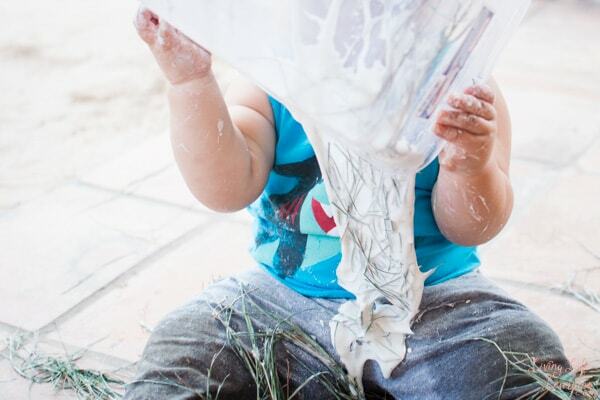 Try Colored and Scented Shaving Cream in the Water Table, Toddler Art with Flour Paint or Yogurt on the Mirror. 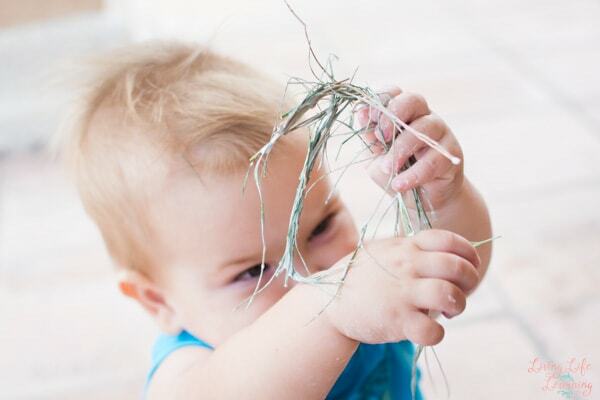 If you prefer less mess, maybe Building Structures with Spielgaben Toys, Simple Spider Craft or Water Balloon Sensory Bin are more up your alley.